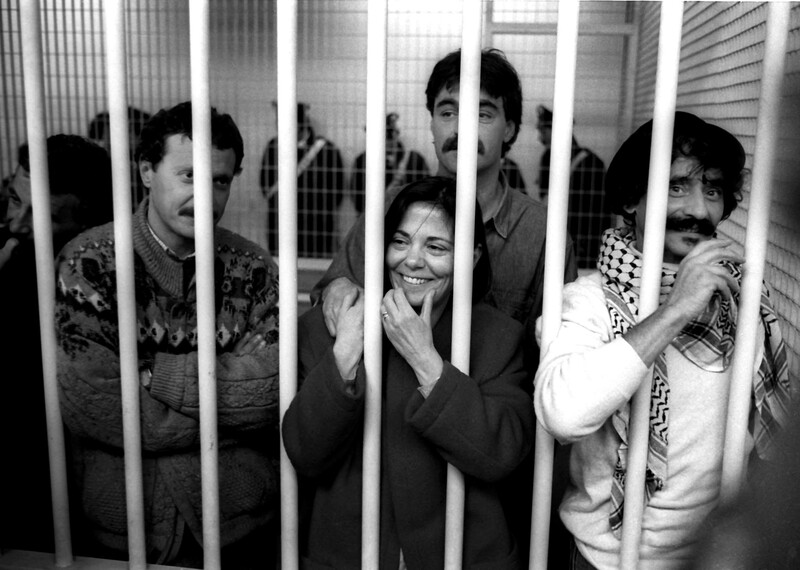 Balzarani in Rome, March 1992 with codefendants during the Moro trial. Interview with Barbara Balzeranni by Silvia di Bernardinis originally published in the Brazilian journal Mouro. 1: Starting from the present. How is it possible in the span of little more then two decades for a country which has seen such a high level of social conflict to now find itself with no points of reference? Do you see a link between this and the way in which the history of struggle of the 70s was liquidated and filed away by the victors? First we need to remember that Italy is a country which in just the 20th century has experienced twenty years of fascist dictatorship, forty years of parliamentary democracy under the dominance of the Christian Democrats and twenty years of Berlusconismo. The current center-left government is held together by an ex Christian Democrat who has completed the work of sterilizing any trace of the left in the party descended from the PCI with a showing of forty two percent in the last elections. All the systems of power of the right, on the other hand, enjoy and have enjoyed a mass consensus which is not insignificant. We can say that the dominant political culture of this country is both very conservative and subversive. It is no coincidence that the “left” places all its trust in the judiciary, legality and security, the hobby horse of all the political “emergencies” which distinguish the “ex” communists. The twenty years of the Sixties and Seventies, after the resistance to Nazi-fascism and the worker and peasant revolts at the beginning of the century were deeply marked by the agency of a working class left independent of the parties and unions of the traditional left and much more interested in the international revolutionary context then the stunted institutional alchemy on the domestic scene. For example we need to remember that the three days of the 1962 Piazza Statuto revolt marked a turning point in the history of the worker’s movement. In the street, fighting the police and in opposition to the discouraging interventions of the PCI and the CGIL, there were to be found above all young migrant workers who paid the price of a thousand arrests and criminal charges. These “small groups of irresponsible elements” who had much in common with the “kids in striped T shirts” who burnt Genoa two years earlier, initiated the period of the explosive antagonism of the mass worker, which the parliamentary and union left no longer had the capacity to guide and control. From here on social antagonism had the strength and reached the level of intensity and involvement which you noted. Until then history had not taken its due and the 19th century revolutionary paradigms had lost the strength and credibility of an alternative to capitalism. From that moment onwards, the eternal present of the “ruling ideas” was shattered, and the concept of critique as an awareness of the affairs of the world and of conflict as the source of social transformation returned to memory. Upon all this, descended the daily repetition of the shameless lie as the only acceptable version of the facts, social peace as an indisputable value, and the rotation of “saviors of the nation” to whom is entrusted the destiny of each and all. 2: The historical trajectory of the BR is inserted within and belongs to the history of the revolutionary struggles which emerged during the 20th century, and in specific is closely linked to the contradictions and transformations experienced by capitalist society in the second half of the 20th century. It was the largest guerrilla movement in Western Europe, both in membership and duration. Despite its defeat and the recognition by its own militants that it is exhausted as a historical experience, it remains today a movement whose reasons for emerging, existing and ending have not been recognized. For whom and for what is this negation useful now? It serves to deny the very idea of revolutionary possibility. The schema is simple: not only were all who made the attempt defeated and disconnected from the “masses”, but above all they did not act independently. All the rumors of secret service infiltration from any quarter, which allegedly remote controlled the activity of our organization serve the objective of insinuating that this not a question of a revolutionary attempt but a reactionary anti-democratic plot. The media construction of this crude but functional inoculation endowed with a full bibliography, and with cinematic and institutional productions (the various parliamentary Commissions), to which with very few exceptions, the intelligentsia in this country has submitted itself, anxiously rectifies our unspeakable crime: that of having demonstrated the vulnerability of power to the greatest extent. It is extraordinary how no interest has been expressed on the real causes for the emergence and persistence of the armed struggle in this country and everything is transformed into the repetition of increasingly distorted connections and murky particularities. The falsity built into this system hardly needs to be demonstrated. But there is another important way in which our experience is not consigned to history and continues to be an in issue in contemporary affairs, its function as a warning to the present, as a deterrent to anyone who today places themselves on the terrain of a possible alternative to the existent. The examples are dramatic: from the slaughter of Genoa in 2001 to the charges of terrorism for No TAV activists. 3: You joined the BR in 1975 after a period of militancy in Potere Operaio. Was your transition from militancy in the extra-parliamentary left to the armed struggle a “natural process” or did some specific event influence this choice? At the end of my experience of the extra-parliamentary groups, discussion of armed struggle permeated the revolutionary left. This was a movement which had broken with party traditions and integrated within its political culture the legitimacy of the practice of forms of violent struggle, of illegality and the use of weapons. The distinction was in the different conceptions of this, for example, insurrectionary or guerrilla and in the politico-organizational modality: military support apparatus for legal activity or clandestinity. But the necessity of heightening the level of confrontation in order to withstand the bosses counter-offensive was never in doubt. Because in those years the repression of the state showed its vicious face in its attempts to push back the extraordinary movement which had revolutionized the way of being in the factory, the school, the street, the prison, the barracks and social relations in general. That movement ran the risk of retreating under the blows of an adversary who sought to restore a favorable balance of power, and retake lost ground, the elements of lost power. Arrests, political layoffs, massacres, coup plots, comrades murdered, attacks on the conquests of the workers movement and on living conditions were one aspect. Along with the constant work of slander and division by the parties and unions. In that context I also looked for the way forward. Two events were decisive: the coup in Chile in 1973 and the detention of the judge Sossi the following year. The first strengthened my conviction that the peaceful road to socialism was impossible, that formal democracy was only the presentable face of a criminal power, and the second showed that it was possible for a worker’s organization to attack, judge and condemn the State as the precondition of the greater freedom which was necessary and finally possible. No, the decision to join the Red Brigades was not a linear process, but an unavoidable break in a long journey of gestation until the facts imposed themselves. 4: The factory was the central site of conflict in those years, characterized by the confrontation of a new kind of working class agency with the moderate policies of the parties and the unions. And in the factories the BR was growing. What climate did you find? What was the relationship with the workers? Yes, the working class in those years had a very great capacity to seize political and material gains. Italy was among the more industrialized countries of the West and therefore the centrality of the struggles which occurred in the factory in relation to the other social sectors was indisputable. The workers were able to block the heart of capital, blocking the production cycle. Worker’s autonomy was not only an organizational form but a political culture which was deeply rooted in the opposition to wage labor of the workers without a trade or a membership card, mostly migrants from the south. These workers were subjected to brutal exploitation on the factory floor, low wages and the hostility of the northern cities, without being contaminated by the taste for compromise of the traditional left. They were pissed and managed to be masters of their own time. They quickly noticed that the actions of the BR against the factory hierarchy contributed to the creation of a climate with a favorable balance of power. I would say that in those years the workers used our presence even on the immediate level of protection against exhaustion and the bullying of managers and foremen. Seizing power and using it to improve the conditions of existence. We certainly didn’t have a majority but the material and political support provided by the factories and the proletarian neighborhoods allowed us to survive and grow for all those years. For example: we would carry out military actions right in the workshops and our comrades could do this thanks to the tacit approval of their workmates. 5: There is a thesis according to which there is a good BR, in the early days, and an evil BR which is militarist, infiltrated, dominated by Mario Moretti, in which you also played a role. A thesis refuted by the facts themselves (all that is needed is a reading of the statement made by Curcio and Franceschini the day after Moro’s execution) and which perhaps increases in the framework of the “politics of repentance”. However real divisions do emerge within the BR after the Moro kidnapping. This completely domesticated and false version of events is part of the conspiracy production which has had good fortune in the official reconstruction of our history. With the goal of asserting the general principle that “revolution is impossible and therefore it is useless and dangerous to attempt it”, the theory, never backed up by a single fact, of the “hidden hand” behind events has emerged and proliferated. Obviously its most hardworking exponents are from the PCI and its vicinity, who have the greatest interest in denying any class content to our organization. Naturally this scheme is perfected with the heightening of the level of our attack. If we had continued the course of a diffuse armed practice (as other organizations were doing), it all would have been resolved every time by a banal ritual of censure and condemnation. But we made a frontal attack on the State and this cannot be forgiven. All the mud thrown at Mario (a comrade in prison from 1981, that’s quite an infiltrator! ), is a low blow from the miserable Franceschini (the hardest hard man who packed away his guns in the moment of defeat), with the obvious result of putting our entire organization under a cloud. Yes, the facts refute it, but it is not necessary to prove anything, it is enough to continually repeat the usual mishmash, which is always more impoverished and poorly cooked up, but served with the greatest fanfare. 6: In 2005 an article published in the journal Gnosis of the AISI, recognized, unlike the institutional left, the validity of the thesis presented in the document On the Imperialist State of the Multinationals asserting that it was hardly unreasonable in its analysis of the transformations ongoing in the second half of the Seventies on both the international and Italian levels, and attributes to the document the merit of having anticipated a series of issues which were to become extremely topical. What do you think of this recognition? I think that perhaps some time in the far future the history of the Red Brigades will escape the morass into which it has been thrown and we will be able to go beyond the contingencies of the moment and document what was correct and what was mistaken. The Imperialist State of the Multinationals was an undeniable insight which we alone acted upon, considering how all the think tanks of the institutional left were still talking in terms of the nation state. This was not a secondary question in relation to political action and to the information around which a diffuse awareness of the ongoing transformations was formed. The fact that we then interpreted this analysis in terms of an accomplished fact and not an ongoing process of development, takes away none of its validity. 7: The proportion of women in the BR was high from the beginning. You told an incredulous prosecutor during the Moro trial to confront the fact that a woman could be assigned a military task of great complexity. Moreover, after the arrest of Moretti, you lead the split and the organization of the BR-Combatant Communist Party. Yes, there were many women comrades and they were employed in leadership positions. We were a politico-military organization with a pyramidal structure, but this does not mean it was bureaucratized. In contrast to the entire political context which I had previously been involved in. In the movements and groups of the extra-parliamentary left which I was familiar with, the revolution stopped where men’s sexist behavior was concerned. Almost all the leaders (who were predominantly men!) held a kind of jus primis noctis which they exercised without encountering many obstacles. And, because in love as in war, it takes at least two, this kind of behavior was also accepted by many women comrades. Another typically feminine role was that of the “angel of the cyclostyle” which says a lot about the state of things. It is no wonder that many militants of the revolutionary groups had an approval for the feminist movement. In the BR I did not experience this inglorious heritage. I do not want to say that personal relations were idyllic, that we did not experience contradictions and had found the formula for perfect communists, but perhaps due to the radicality of the choice that such a life entailed, I experienced neither discrimination or macho attitudes towards women comrades. It was a matter of indifference if a combatant and therefore also a leader was a man or a woman. 8: The Chinese revolution and the Latin American guerrilla movements-in particular the Tupamoros from whom the BR took their organizational model-were an influence on the BR. What do you think of China today and of Latin America, specifically of Mujica as president? This question would require a great deal more space. In brief, I think with regard to China, that the great hope for a solution to the deformations we defined as Soviet “social imperialism”, has been over for a long time. Now it is the greatest state capitalist power, a discontinuous socialism, which on the one hand has starkly exposed the instability of the growth process of the capitalist model on the world level, and on the other it retraces the same deadly path of inequality, super-exploitation of labor power and disregard for the environment. The image of Beijing suffocating in fumes for me brings to mind the process of primitive accumulation in England. With the difference, that then it was the beginning of industrialization for a handful of Western countries, while now the reckoning is coming for the “emerging” countries, no longer just markets to exploit, which are so much more significant in terms of population and necessary resources. As for the countries of Latin America, they have for many years represented a “laboratory of a new socialism” which has had a significant influence on the Western anti-globalization movement (remember Porto Alegre) and have created a new perspective of freedom, environmental awareness and social justice, capable of independence from the current inter-imperialist rivalries. For Mujica I have the greatest respect, for who he was and for who he is now. 9: At what point were you aware of having lost? There were many points. The BR emerged and developed in a period of working class offensive. Out of that struggle we interpreted the inherent “revolutionary” and “power seizing” content and translated it into our politico-military strategy. The central subject upon which we based our program was the working class. The moment in which the wind changed and the bosses counter-offensive began (the 61 political terminations and 24000 layoffs at Fiat up to the cost of living adjustment agreement) also made everything more difficult for us. The “attack on the heart of the State” was an obligatory transition made to deal with the escalation of the confrontation outside the factory gates, a terrain which was no longer sufficient to further continue the offensive. But it is completely obvious that with our main point of reference, the working class pushed back on the defensive, the armed struggle was severed from one of its fundamental preconditions. Paradoxically in the years following the Spring Campaign against Christian Democracy, we were much stronger in numerical and military, but much weaker in political terms. This was reflected organizationally in various splits: that of the “Walter Alasia” Column in Milan and the Guerrilla Party in Naples. Splits which were precipitated by harsh criticism from our imprisoned comrades, who had little patience for our difficulties in confronting the new stage of struggle which they misinterpreted as favorable for the organization of the masses on the terrain of the armed struggle. In 1982 we kidnapped the American General Dozier. The terrain of “war on imperialist war” seemed to us to be ideal for retaking the initiative on a terrain which could give oxygen to a movement on the defensive which had experienced the capitulation of all its strongholds. The result was disastrous. Not only was our prisoner rescued but it was the beginning of a period in which the use of torture went from episodic to systematic. This tool of coercion acted to expose our political crisis, the symbolic damage cause by the traitors was added to the organizational damage from the information extracted. Authentic State terror and political disgrace: a fatal mix. We borrowed from the Chinese Long March the slogan of “strategic retreat”. We wanted to figure out if the armed struggle still had a logic and legitimate reason to exist. Perhaps that was the moment which brought us closest to an awareness of our defeat but we did not understand it fully. We were a clandestine combat organization and we had nothing to concede, if we did not surrender body and soul to an enemy ready to accept our abjuration. Unwilling to do this, we committed ourselves to enduring what we continued to see as a cyclical crisis and not the end of an era as appeared obvious only some years later. 10: “Among these comrades, I would almost always see the law of greater leadership and not of greater power assert itself. The greatest responsibility was accompanied by the absence of privilege. With them I would learn what it means to really have nothing of your own. To overcome great and small pettiness in giving and receiving. I would experience relationships of a particular intensity, as happens when the other is something precious to protect. I tasted the flavor of an honest and transparent exchange based on trust and without self-interest beyond the reciprocal benefit shared between people wealthy only in the existence of the other. And I knew the indelible mark of a radical life choice of men and women, a radicality which more then in other my other prior political experiences, was able to minimize discrimination and subordination, sexist and otherwise.” (from Comrade Moon). In a few lines you summarize the driving ideals of part of a generation and the attempt to actualize them. What remains of the armed struggle? What remains is the failure of an unselfish attempt to humanize a class divided society. That of a group of communists who dared to attempt liberation from wage labor and the market, to make utopia realistic. We did not win, we could not have, now this is very clear, but perhaps this attempt has left something useful for the struggles of the future. The enemy is not invincible, even if it often seems that way, and you can never be beaten for good. 11: After 2011 years you have full liberty, following twenty one years of prison and five years of conditional liberty, prior to this you spent a decade in the underground. Writing seems to have taken an important, perhaps the most important role in your life. What is “normality” for you today? Tracing a viable map of things. Incarceration is above all a detachment from the affairs of the world. Locked up, life is reflections, unverifiable ideas, representations devoid of substance and without experiential knowledge. In a time which develops as fast as the current one, 10 or 20 years of prison eliminates any ability to be in accord with the wavelength of common communication. It’s as if, upon awakening from a long sleep, you found yourself without an antidote to the poison of disorientation, which everyone in a state of freedom, can swallow drop after drop until they are immunized. When it happens, you must take your bearings, step away from the short term perspective, and buffer the impact of the chatter and falsehood in which you find yourself immersed. For me writing has been and is this: therapeutic, confident, inclusive and reparative. Like the woven strings in the art of Maria Lai, able to repair old rifts and wounds still painfully open. To do this you must seek out where ever the history of the world is not that written in books and repeated as truth in words from the high seats of power, but in the testimony which the human journey has left in matter, in memories handed down, in hands marked by exhaustion, in the histories of which History is made and which are undergone by all. This is my “normality”. Following the traces of this path to give me some answer and loosen the grip on my breath. 12: A journalist and militant of the Montoneros, Rodolfo Walsh, who lost his life during the last Argentine dictatorship said that the dominant classes have always sought to ensure that the working people have no history “every struggle must start anew, separated from those of the past, collective experience is lost, its lessons are forgotten. History appears as private property, a property with the same owners as everything else.”. Would you to comment on this?